Live phone support is available every day 8:00 am -10:00 pm Central Daylight Time Chicago (GMT-5). Call 847.334.7466 ask for Ray. Serving the web for over 15 years! ABOUT US CONTACT US MOBILE SITE SHIPPING & TRACKING Over 17,000 online orders shipped! Many orders ship the day they are placed! Flat rate $6.95 shipping on all lettering orders! Great accents to your lettering. Get 12 for of the style you choose. Compliance stickers up to 3" tall to get you legal. Stickers $7.99 / Set of 2. Magnets $19.95 / Set of 2. Two Line Magnets - Four Line Magnets - Reverse Magnets. Choose from several popular sizes. Starting at $34.95 / Set of 2. Add outdoor durable clip art to your lettering order. Choose one of these designs or ask us for more options. Get a set of two boat stickers. Choose from a variety of size and spacing options. We cut your letters and numbers out of attractive designs. Up to 5 inch tall letters and numbers. Up to 3 lines of text in 16 attractive designs. Easy on piece install. Two sizes 24" x 12" or 18" x 9". Two - Three or Four lines of your text. Easiest to install - All lines install in one piece! 3 inch letters ALL CAPITALS can be read from up to 75 feet. Sold by the line. Up to 26 Pre-Spaced letters or numbers. $14.95 for the entire line - Add a duplicate line for just $2. 9 inch letters ALL CAPITALS can be read from up to 225 feet. Sold by the line. Up to 15 Pre-Spaced letters or numbers. $19.95 for the entire line. 12 inch letters ALL CAPITALS can be read from up to 300 feet. $25.95 for the entire line. 2 inch letters ALL CAPITALS can be read from up to 50 feet. $8.95 for the entire line - Add a duplicate line for just $1. 6 inch letters ALL CAPITALS can be read from up to 150 feet. Sold by the line. Up to 20 Pre-Spaced letters or numbers. $16.95 for the entire line - Add a duplicate line for just $3. How durable are vinyl decals? snow, ice, sun, and even salt for 5-6 years. Indoor life is almost unlimited. What Surfaces will our lettering adhere to? 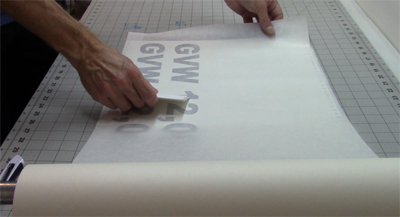 Our self adhesive vinyl lettering will stick and last on almost any smooth clean surface. 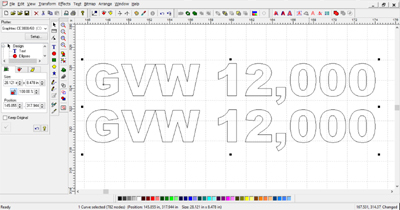 Below are samples of good surface types for vinyl lettering. Self adhesive vinyl lettering is perfect for application on both the glass and painted portions of almost any vehicle or smooth substrate. The surfaces below are not recommended for our lettering. being worn in a parade. They then remove them before washing the shirts. Use of our lettering on inflatable's works great when the object is inflated. strictly promotional and not recommended. The lettering is then cut to exact size and boxed for shipping. the cut process is your lettering cut into the material. removed and then the center of the 0's will be pulled out before taping. 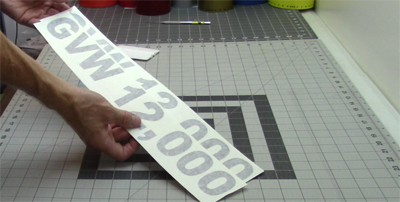 Remove the transfer tape and your lettering is installed. Apply the lettering to the desired surface. Peel your lettering from the paper backing. Peel the application tape of off the paper backing. Peel slowly to make sure the lettering comes off with the tape. 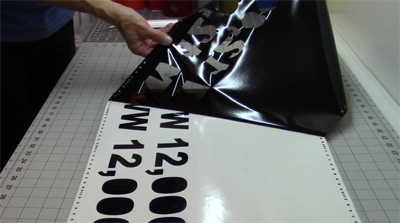 Apply the lettering to your sign surface by running squeegee (or credit card) across the tape from one side to the other. Make sure to apply pressure over all of the lettering. Remove the tape slowly making sure all of the lettering stays down. If the lettering comes up with the tape simply lay the tape back down and re-squeegee. 90°F simply cool the surface with cold water and work in the shade. How to install your lettering. Your lettering ships Pre Spaced for easy installation. Simply follow these three steps. Not sure what size lettering to order?